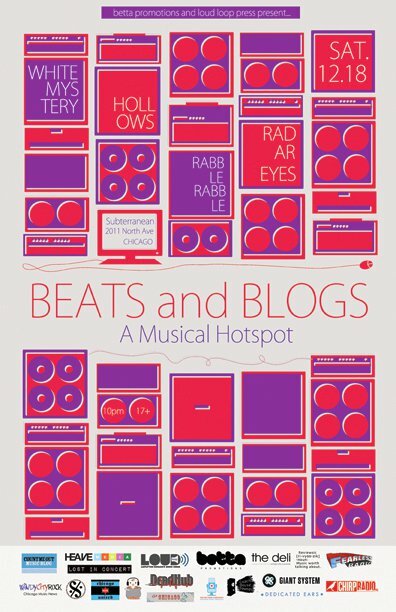 Have you heard about the “Beats and Blogs” show going down at Subterranean on Saturday, December 18? It's going to feature four of Chicago’s finest, most rockin’ bands – White Mystery, Hollows, Rabble Rabble and Radar Eyes. We’ve been working with Betta Promotions as well as Loud Loop Press and many other top-notch Chicago music sites to get the word out, so it’s bound to be a crazy fun musical party you won’t want to miss. To add to the excitement, we’ve got a pair of tickets to give away! 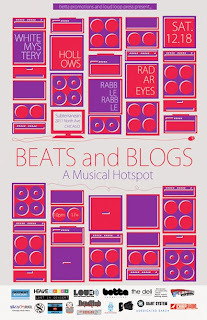 To get in the running, just shoot us an e-mail with “Beats and Blogs” in the subject line and your first and last name in the body, and we’ll select a winner at random to score the tickets. We’ll be accepting entries until 10 a.m. on Friday, December 10, and we’ll announce a winner once the contest is closed. Update 12/10 - The contest is now closed. Congratulations to Angela K.! Thanks to all who entered.